Theydon Bois started celebrating the spirit of Christmas with the ceremony of the lighting of the Village Christmas Tree on Friday 7th December. Inspite of the intermittent rain a good crowd assembled on the dry hardstanding in front of the Village Hall. When the new village hall was completed last year the Parish Council decided that The Green was no longer a suitable position, due to the excessive rainwater that accumulates there making it very muddy, also the problems of the road traffic and the electricity cable running above the road. The benefits of the new site were certainly obvious over past years when in similar conditions villagers had been up to their ankles in mud. Wilfred Shales, extended a warm welcome to all attending and enjoying the event. He also thanked the shopkeepers and many others who had given help and support. The lighting of the tree was performed by Caroline Law, the Theydon Bois Citizen of The Year. Caroline has done much hard work running the village Neighbourhood Watch. Carols were led by our new Vicar of St. Mary's Rev. Canon Colin Travers with the help of the Theydon Bois Singers, and the children from the Theydon Bois Primary school. John Eaton, Chairman of the Parish Council gave a short speech and Rev. David Penegar gave a prayer and blessing. The children then "mobbed" Santa as he distributed the sweets he had brought when he arrived on a beautifully illuminated sleigh drawn by a reindeer? Well a horse really! For some time he virtually disappeared under the hoards of children and could only be rescued by John Eaton when the sweets ran out! He certainly deserved his glass of Mulled Wine which together with Hot Chocolate and Minced Pies followed the ceremony in the Village Hall. During the event a collection was made for charity , this year it was for Haven House Foundation Hospice. 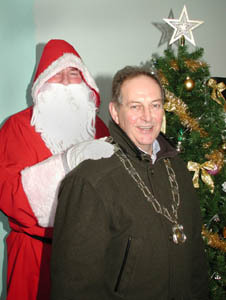 Santa thanks Parish Council Chairman John Eaton for his rescue. For more photos of the ceremony Click Here. Over 55? : Then this New Club in the village is extending an open invitation to anyone in Theydon Bois to come along and join in their weekly activities. The Over 55 Club meet at the Village Hall, Coppice Row every Tuesday at 2.00 pm finishing about 3.45 PM You will get a cup of tea, biscuits and on special event days sandwiches and cake. Entertainment includes guest bands, singers, magicians, sing alongs and bingo. You will receive a warm welcome, meet friends and make new friends. Come along next Tuesday and remember the CHRISTMAS PARTY is on Tuesday 17th December, 2002. If you need to know more then give Wendy Walker a call on 01992 814795. Christmas in Theydon:The Christmas Tree Lighting is this Friday 6th December at 6.30 PM at the Village Hall. 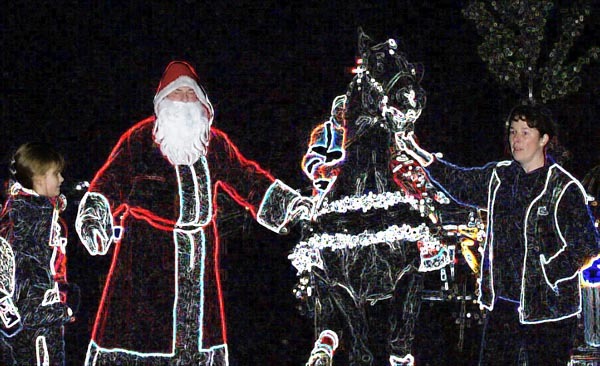 Make sure you bring the children to see Santa on his illuminated sleigh and to join in the carol singing. 22nd Dec. 6.30pm - Nine Lessons & Carols. 24th Dec. 4.30pm - Christingle. 24th Dec. 6.00pm - Christingle. 24th Dec. 11.30pm Midnight Communion. 25th Dec. 8.00am - Christmas day Communion. 25th December 10am - Family service. 25th Dec. 11.15am - Shortened Holly Communion. BUXTON TRUST - AN IMPORTANT NOTICE: At a recent meeting of the Trustees of the Buxton Trust much concern was expressed over the increasing amount of bad behaviour and vandalism which is occurring in and around the Trust Ground, mainly by a small group of young children and youths. These children are regularly coming to the ground after school, in the afternoon, with intent to cause damage to the Trust site. We have no issue with well behaved people visiting the Trust Ground but we are against wanton vandalism and uncontrolled behaviour. Some of the young folk have been identified on the CCTV equipment positioned on the premises. Therefore, if the problem continues, the Trustees of the Buxton Trust give notice that Legal action will be taken against any offender(s) and/or their parent/guardian. In fairness, we are seeking the help and understanding of ALL parents in making sure they know the whereabouts of their children out of school times. It is wrong for parents to assume their children could not become involved in bad behaviour. All that is needed is for those parents to recognise the fact and to do something positive to stop the problem. In the main these are local children and parents must honour their responsibility to their family and our community. The Ground is also suffering from Golfers practicing their swing but leaving divots in the grass surface and Dog owners allowing their pets to defecate on the grass surface without clearing away the mess afterwards. These people believe the Trust Ground is for anyone to use. This is not so. The Buxton Trust Ground is PRIVATE and donated for organised sport which is sanctioned by the Buxton Trustees. Anyone ignoring the public notices or fair warning can be subject to a prosecution. We are doing all we can to preserve the inheritance entrusted to our village but a small minority are prejudicing it's well-being. Please help us to right the situation before it becomes a major problem. Thanks to all those that helped:The Parish Council would like to thank all those who turned out to help in the Litter Pick on Saturday 16th November. The Litter Blitz has been organised to help keep our village tidy, The Parish Council is promoting litter picks which are held periodically on a Saturday morning. The next litter pick is on 1st March. Many people will think that we pay our community charge and that litter is a matter for Epping Forest District Council, which in many respect is quite right. However, we are appealing to those of you in our community that feel that it is our civic responsibility to help the Parish Council who are taking the lead to keep Theydon Bois tidy, no matter what we endure from uncaring people that use our village as a dumping ground. Anything that you can do to promote a tidier village would be appreciated and a good turn out at the litter picks would be particularly welcome. Please come along to future Litter Picks and give a hand if only for a short time. Meet at the Village Hall. YOUNG VOLUNTEERS DAY AT COPPED HALL: More than twenty young volunteers descended on Copped Hall recently to help with the restoration of the grounds of the Mansion. They were all pupils from the Davenant Foundation School in Loughton and were taking part in the Make A Difference Day organised by the Epping Forest Volunteer Bureau. This event was part of a nation-wide activity to introduce young people to volunteering and so help the community generally. In the Epping Forest area, groups of youngsters were helping in charity shops, garden centres, hospices, children's nurseries and other similar organisations. At Copped Hall, the Davenant pupils set to with enthusiasm in helping with the extensive clearance of parts of the grounds under the direction of Alan Cox, the Architect and a Trustee of the Copped Hall Trust. Alan explained the nature of the restoration project for the site and also showed them the exhibition of photos and historical detail relating to Copped Hall which is in the Racquets Court. Cllr John Padfield, another Trustee, said that the students had put in a special effort and it was an extremely successful day. The Trust was particularly pleased to see the Davenant pupils because their help has established a link with this school as part of the Trust's educational policy to involve schools and young people generally in it activities. Visits by other schools and colleges are welcome and enquiries can be made via the Chairman of the Trust on 01992 573369. Operate a JCB universal digger. Drive "dumpier" truck. Mow grass with a tractor. Reverse a trailer-vehicle. Dowse (find water). The Chairman of the Copped Hall Trust, Denys Favre, started the training programme by being shown how to drive a dumper truck, at which he quickly became proficient. Local racing driver Dave Karaskas, one of the Friends, then took control of the JCB, the handling of which he found to be quite different from a Formula One racing car. Others quickly followed suite although one lady caused some mirth when, during instruction on the JCB, she nearly unloaded a pile of dirt onto nearby onlookers instead of into the dumper truck. Vehicle reversing also caused some problems but was quickly mastered by most trainees after a little practice. However, mowing the grass with a vintage Ferguson tractor was a hot favourite and the car park grass almost disappeared after some hours. Meantime, the dowsing party under the instructions of Gordon Brown was dowsing the grounds of the Hall with some interesting results. The participants were surprised to find that this practice actually worked and excitedly plotted several watercourses across the grounds, the existence of which will prove useful for future work in these areas. But there was a serious aspect to all these activities. Once proficient, the Friends used the equipment to clear the car park of rubble, stabilise the ground in parts of the area and move a large quantify of scrap iron into a salvage container. The event was organised by Gordon Brown who was supported by Brian Wackett, who supplied the JCB and dumper truck and gave the relevant instruction, and Dennis Chasney who provided the Ferguson tractor and Jeep/Trailer and also instructed accordingly. Among the "trainees" were Denys Favre, Paul and Moira Arnhill, Jimmy Keith, Dave and Adelaide Karaskas, Iris Newbery and Arnold Verral. Other Friends who helped with the event were Sylvia Keith, Chairman of the Friends, Trevor Roberts, Brenda Bowtle, John Gervis, Duncan Lowther and Margaret Gervis who provided the usual excellent lunch. At the end of the day, more than £300 had been raised for the Trust's restoration funds and a number of Friends had acquired valuable skills which will prove useful at Copped Hall in the future. HEARS this in Loughton: Herts & Essex Architectural Research Society has just just sent us their program for the coming season and holds most of it's meeting in the Roding Valley High School, Loughton at 8.00 PM Don't be put off by the scientific sounding name this friendly society welcomes members and visitors whatever their level of interest in Architecture. Further information on our Clubs Details page. Litter Blitz:This Saturday 16th November, 9.30am - 10.30am a Litter Blitz has been organised to help keep our village tidy. Please come and give a hand if only for a short time. Meet at the Village Hall. Coming Events:There are a number of interesting events taking place in the New Village Hall in the near future as this magnificent venue is proving extremely popular with event organisers. This Saturday, 16th November fro 10.30am - 5.00pm there is a large exhibition of at least 10 Model Railway Layouts by the Epping Model Railway Society. Admission is £2.50. Next Thursday, 21st November at 8.00pm is The Theydon Bois Horticultural Society's AGM with Cheese & Wine and this is proceeded by a talk, "The Lee Valley Park, A Virtual Tour" by Sandra Thompson. All this is free. On the afternoon of Saturday 23rd November at 3.00pm there is A Concert of Light Music by the Harlow Concert Band. Tickets are £2.50 with profits going to St. Clares Hospice. Friday 29th November sees an Antiques Evening at 7.30pm. Tickets are £10.00 from either Tel: 01992 812273 or 01992 814156. 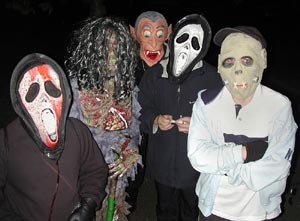 Halloween in Theydon: Thursday night was was not a night for the of the nervous to be out and about in the village. Our site Editor was visited by this group of Tick or Treat youngsters he opted for the treat hoping that later he might get the treat of a visit from Buffy, No such luck! Theydon Art Group Exhibition; Friday 8th November 6pm - 10pm, Saturday 9th November 10am - 6pm. 41st Art Exhibition by the Theydon Art Group with paintings for sale. Admission with catalogue 50p. Refreshments available. 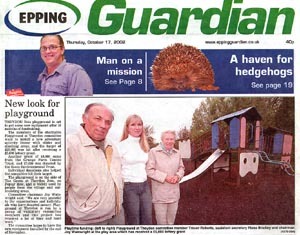 PAT makes front Page News: Three hard working members of the Playground at Theydon committee made the front page of a recent edition of the Epping edition of The Guardian after the playground received a £5,000 lottery grant. "New look for playground. Theydon Bois playground is set to get some new equipment after 18 months of fundraising. The members of the charitable Playground at Theydon committee want to install a new adventure activity frame with slides and climbing areas, the target of £20,000 was hit after receiving a £5,000 lottery grant. Another grant of £4,000 came from the Grange Farm Centre Trust and £7,000 was donated by the Essex Environmental Trust. Individual donations also helped the committee hit their target. The playground is on the side of The Green at Theydon Bois and is widely used by people from the village and surrounding areas. Committee chairman Joy Wainwright said: "We are very grateful to organisations and individuals who have donated money. Playground at Theydon is run by a group of voluntary committee members and this project has required a lot of time and hard work." The committee hopes to have the new equipment installed by the end of November"
The Royal British Legion Service of Remembrance: This will be held on Sunday 10th November starting at the War Memorial at 10.45am. Those wishing to join the parade should meet outside the telephone exchange at 10.30am. Medals may be worn. Our service will be led by our new Vicar Reverend Colin Travers. At the going down of the sun and in the morning "We will remember them". 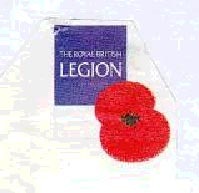 The Royal British Legion is a charity whose work is to help disabled service and ex-service personnel and their families who need assistance. Most of their work is done at a local level by volunteers who give their time and effort by helping needy ex-service people in the area. Please give generously when you see the poppy sellers around or if they call at your homes. And please 'do wear your poppy with pride'. It is hoped that all of us, wherever we are, will pause for 2 minutes at 11am on Monday November 11th. Steel Magnolias: Theydon Bois Drama Society new production runs from Thursday to Saturday 24th - 26th October in the Village Hall and is Steel Magnolias by Robert Harling. Tickets are £5.00 from Carol & Graham James. Tel: 01992 812250. Playground at Theydon Fund Raiser: Friday, 22nd November at 7.45pm for 8.00pm In the Village Hall, Coppice Row, Theydon Bois, a Quiz Night to be held in aid of Playground at Theydon Funds. A fish or chicken and ships supper will be served. There is a vegetarian option available. Please bring your own drinks and glasses. Tables of 8. Contact Liz 01992 814951 or email: Joy Wainwright . ALERT: There have been a number of break ins in the Village recently. Please make sure you lock all your doors and windows and be particularly careful not to leave car/house keys where they can easily be seen. HELP WANTED The Village Hall needs a relief cleaner for up to 2 weekends per month. This will mean working either late on Saturday night or early on Sunday morning to undertake any necessary cleaning before other hirers have use of the Hall. There would also be the opportunity for holiday and sickness cover. Pay subject to negotiation. For further details please contact the Hall Manager on 01992 815150. Early for Christmas? :The Christmas Tree Lighting is on Friday 6th December at 6.30 pm at the Village Hall. Make sure you make a note of this event in your diaries. The Epping Citizens Advice Bureau: has asked that we mention their need for more volunteers. Their contact is Liz Scott, Manager, Citizens Advice Bureau, 50a Hemnall Street, Epping, Essex CM16 4LS. Tel 01992 574989.
e-mail them in or drop them into Madeline our Madeleine our Parish Clerk at the Village Hall office. Parish Newsletter: Wilf Shales has entered our Parish Newletter for The Village Magazines Competition run by the Rural Community Council of Essex. 3 different editions were requested, Oct and Dec 01 and April 02 were chosen. Lets hope we do well. Jump in some puddles and slide in some mud. Better than shut in the car. I've heard of something called Walk to School Week. Children need regular physical activity to stay fit and develop a habit of being active for their future health. Children are exposed to more pollution inside a car on a busy road than they are at the roadside. Walking to school is a good time to chat with your child, notice the seasons and find out what's going on. Children will learn pedestrian skill so that they know how to cross roads safely and to be aware. Being active reduces stress and raises self esteem. Once your children are ready, walking to school alone is a chance to gain a feeling of independence. If we continue as we have been doing, traffic will rise by more than a third over the next 20 years. Newsletter Distributors Wanted. Help is needed with the distribution of the Parish Newsletter if you live in or near Graylands, Greenglade, Pakes Way and Red Oaks Mead & can help please contact our Parish Clerk. 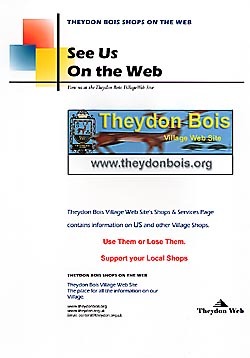 Theydon Bois Village Association Steady: Progress is now being made towards the completion of the snagging items that remain to be addressed in the new Hall and it is hoped that all work will be completed by the end of October - one year on from first being occupied! The final cost is expected to be within budget. A draft list of all those who have qualified as Patrons can now be seen at the Village Hall. Wherever possible, please check that you have been properly recorded - if not, please contact the Hon. Secretary on 01992 813491. There are a few additional items that are needed to complete the project, so if there is anyone else who would like to make a donation, could they please contact the Hon. Treasurer on 01992 812541 as soon as possible. Donors of £500.00 or more will finally be recorded on a Patrons Board to be permanently displayed in the Hall. Unfortunately there has been some delay in obtaining all the material and photographs for these new pages. We hope to progress this item soon, we apologise to all concerned for the delay. As we have previously noted In July of last year it was brought to the attention of the Parish Council and the Web Site that trade was being lost and livelihoods put at risk as people shopped elsewhere for goods that could be obtained for the same price in the village shops, the result of this would be that we would all suffer. Since July we have seen further closures.